Want to know how Maz Kanata actually got Luke's old blue lightsaber? Curious to find out how J.J. Abrams is working to make Star Wars 9 the best sequel since Disney bought Lucasfilm? Interested in learning more about Rey, Finn and Poe as their story comes to its ultimate close? Well, you've come to the right place cause we've got plenty of new information as production kicks off on the next installment of the Star Wars franchise. 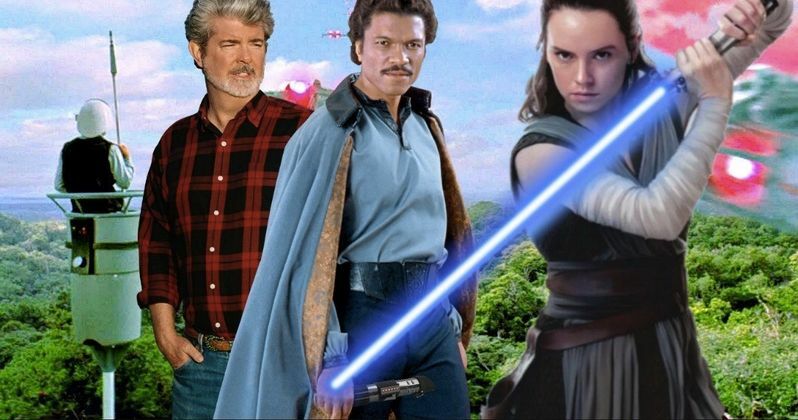 There hasn't been an official announcement from Disney and Lucasfilm, but it's being reported that Star Wars 9 began shooting this week, and already has a couple of days production under its belt. As the final sequel in The Force Awakens trilogy gets underway, some intel is slipping through the cracks. These are just rumors for now, but they come from legit sources, and as we've seen with the past two movies, these rumors usually come true. The first bit of news deals with the return to a very familiar location. It was widely reported in early July that director JJ. Abrams would be taking his crew back to the Cardington Airship Sheds in Bedfordshire, England. This location was first seen during the climatic ending of A New Hope and served as home base to the Rebels. The Cardington Airship Sheds were used to construct the Massassi outpost, aka Base One, on the planet Yavin IV. And it was also seen in the more recent Rogue One. Now we may know what is being shot here for Star Wars 9. This final Force Awakens chapter will bring Rey, Finn and Poe together for some adventure time, which we haven't really seen in the last two movies. The trio will be on Yavin IV when it's attacked. By whom? We can only assume the First Order. Mike Zeroh has been collecting info on the movie since it began production, and says this about a big chase scene that could see the base on Yavin destroyed for good. "We have been learning more about Star Wars 9 when it comes to a shoot over at Cardington. Cardington Studios in the U.K. to be specific, in one of the sheds for a shoot that is to begin next week. This scene will feature a large green screen that will be used for a chase scene involving Finn, Poe and Rey. Pyrotechnics will be used along with practical effects. Many extras will be dressed as pilots and civilians. The shoot is expected to begin next week. This is said to be going on for five days for this specific scene." It's suspected that this scene is the big attack on Yavin IV after the Resistance returns there to plan their next attack on the First Order. But Kylo Ren and General Hux have been tipped off and carry out a full-blown assault before the Rebels can get in the air. While Star Wars 9 won't be blowing up the Millennium Falcon, it's assumed that this sequel will destroy one of the more iconic locations from the franchise, leaving it a burnt out husk in the galaxy's long and winding sidewalk. So long Massassi outpost, it was nice knowing you. Apparently, Star Wars 9 will have a lot of prequel and original trilogy connections and continuity. J.J. Abrams knows a lot of fans didn't like The Last Jedi, and it's his mission to make this sequel the best one yet, and he's really got to knock it out of the park. The rumor is that Disney and Lucasfilm brought in George Lucas to consult on the script. While they pretty much turned their back on him when The Force Awakens was first coming together, he's become like this trilogy's Obi-Wan Kenobi. Imagine Kathleen Kennedy calling out to him as their only hope. George Lucas stayed pretty muted as Disney began to reboot the franchise. But he did show up on the set of Rogue One, where he made a few suggestions. He then visited Ron Howard on Solo, where he even reworked a scene. Now, it's rumored that he's working alongside J.J. Abrams to make sure they get this one perfect. It isn't known if he's on scene in the Cardington sheds, or if he just casually dropped in on the script writing sessions. Expect that official info to come out at a later date. It has already been widely reported that Star Wars 9 will begin with a huge time jump from The Last Jedi. This is in place mostly to rework the General Leia scenes that had already been planned out. Now, Finn will have a whole new outfit and his hair will be substantially longer. We've heard that before. Poe will be getting a new flight suit. But the real news here is that Rey is getting a completely new look that is unlike anything seen in Star Wars before. The look has yet to be described. But it should surprise fans of the series. As explained, Luke has a different look in all three original trilogy movies. Though, this is different. Rey is getting a maxi-makeover. And we can't wait to see it. Now, the most interesting new rumor to come out since shooting started is that Maz Kanata will have a pretty big role to play in the movie. She was barely in The Last Jedi, relegated to a glorified cameo. Here, she will get a giant new spaceship that is described as a pirate ship. It has huge metallic wings that are like the sails on a pirate ship. And it's maned by a 'diverse' crew of humans, droids, and aliens. Which sounds like the perfect buffet for Pando Lando and his animal urges. Rey will be joining Maz on this giant ship. And it's believed that there will be a scene between Maz and Rey that finally explains where Luke's old blue lightsaber came from. The idea now is that Lando is responsible. After the events of Return of the Jedi, he went back to Cloud City, and discovered the lightsaber in a lost and found box gathered up by a couple of Ugnaughts. He took it to Maz, knowing she'd know what to do with it. While we haven't seen Maz and Lando interact before, there is apparently some LEGO release that has Lando hanging out in Maz's Castle, which is said to help set up their relationship. Apparently Han and Lando have both known Maz for years. It's on this spaceship that Maz is said to help Rey repair her lightsaber. J.J. Abrams will make sense out of it all, for sure. That's a lot to take in at the moment. There will be plenty more rumors coming out of the Star Wars 9 base camp as shooting continues.